was thinking of doing a 2 dayer down in Sundown National Park sometime in the next 2-3 weeks. I've got the Bushpeople's Guide and the 2nd walk they reccomend sounds pretty promising. From the Broadwater Camping ground up McCallister's creek, past Split Rock and Double Falls, up Mt Donaldson and back to the camping ground via Mt Donaldson ck. Just wondering if anyone's been in that way recently or has any advice about this or any other routes in Sundown? I've only been to this park a couple of times and have been based in the northern end. I can tell you it will be freezing cold though. Any walk you do here is going to be good - its quite different to any other park in south -east Queensland (even the nearby Girraween which is definitely worth a few trips). It would be a long way to get to the southern end of the park if your travelling from the Brisbane region. In the northern end a conventional car will get you to the 'homestead' and you could do a 2 dayer via Red Rock Falls. If you have 4wd you could venture further into the park and do a couple of great daywalks from a basecamp (up Blue Gorge is good fun). Thanks isoma for the quick reply! Looking at the map, I think i'll go with your idea and have a bit of an explore in the north of the park. As for the cold, i'll certainly be packing that that extra thermal and taking a warm sleeping bag. Sadly no 4wd, but looking forward to walking through a different style terrain anyhow. Just curious though what your experiences of heading up Blue Gorge were and how you found the walking in northern part of the park, ie navigation? Navigation shouldnt be too hard - the Severn River bisects the park and there are a couple of major dingo fences that you'll come across( which are on the map from memory). Most of the terrain is relatively open except for scrub at the top of the gorges. Blue Gorge makes a good scramble, there a quite a few waterfalls and massive blocks to negotiate but I dont recall any real difficulty. It might be a bit much to get to Blue Gorge though on a 2 dayer without 4wd access. We went there as a daywalk from a basecamp near Rats Castle. If you have the Bushpeoples Guide and relevant maps I'd probably recommend the Red Rock Falls circuit. thanks mate for your help, I'll post a trip report when I get back just in case anyone else is interested. Definitely interested Rafael-don't forget some pics ! Thanks for the report and photos Rafael. I havent been to that end of the park before - its on the list now though. That climb up Mt Donaldson looks like a bit of a slog though - probably one for the cooler months. Great stuff. We are planning a trip to Sundown for the upcoming long weekend. It is going to be a 3 day hike and I expect that we will start in the Southern end of the park, follow the creek up to wallaby rocks waterhole and then head east to Mt Donaldson. Then backtrack and head north to the Hell hole the next day and head up through Blue Gorge creek and then back south on the Third day. Will add a full report once we are done with track notes. Sounds like a great trip you've got planned. Would love to hear how you find Blue Gorge, I'll wait the trip report! By the way Marion (in the photos with the red, not orange, top) also appears in tas-mans post 'History of Climbing in Queensland' 9 Oct 2010 - follow the link to the climbing blog, scroll down to see another photo of Marion dated 1967, this time with a red helmet. 2011 and still doing the hard yards. Yeah we are headed out this long weekend coming. I have just been looking at the route plan and the photos that you linked there. Thanks heaps for that. Having looked at it I think that the route is much longer than the reported 30ks for the Blue gorge - Ooline creek circuit. So going to ditch the Mount Donaldson part so we can do it in 3 days and give ourselves more than enough time. Okay, this was a really interesting weekend for us. We started on the Saturday morning at about 10am and headed up the Severn. We initially went past the Ooline creek merge point on the left and followed the Severn on the left. This was a mistake. It is much easier to criss cross the river and find the road that cuts across each point. If you are going to follow the river make sure you do this. We didn't find it until about 2 hours in when another group came up on us and told us about it. So best to cross to the Southern side of the Severn at Ooline creek merge point and then start following up the river from there. It will cut out a lot of time. The flooding has really cleaned out a lot of scrub in the area and visibility whilst on the river is good. Very rocky though which becomes a challenge for the stabalising muscles in your legs. We got as far up as Wallaby rocks and camped there on the first night. Saw a fair few deer. The second day our plan was to head up Blue gorge from the south entrance right through to the north and then follow the fencline down to Ooline creek. We got right up into the gorge before reaching a point where their was a waterfall and a 5 metre wall. We could not find a way around it and so as it was 3:30pm we decided the safer option was to follow the gorge back out to the Severn and camp there for the night and then walk the next morning out on the Severn. Does anyone know if it is possible to follow Blue Gorge right through from the South? Yes I have done Blue Gorge quite a few times. There are various waterfalls which appear to block the way, some can be climbed directly (depending on the amount of water), others need to be bypassed by traverses. The first significant one we have always gone directly up, but I believe it can be bypassed by a long scrubby traverse on the true right. Others are traversed on either the left or right. There is some exposure and crumbly rock ledges to negotiate but nothing too difficult, just needs a bit of care. 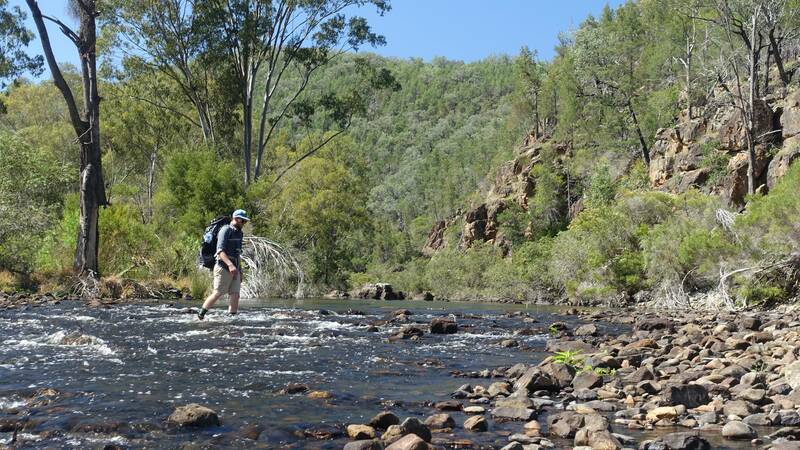 Looking to go into the park soon and do the Blue Gorge Ooline Loop, but, am new to Queensland and have no idea where to get a topographic map for the trip. We are coming in via Tenterfield in NSW. Can anyone help? Are there any free online topo maps for Queensland that can be downloaded? The park web page does not seem to mention whether there is any ranger station where more information can be collected? Hema maps have a map for Girraween, Bald Rock and Sundown NPs. Whilst there is a ranger's quarters at Sundown, there is no real ranger station for information. But your best bet would be to pop into Girraween NP first and they should have maps. All not far from Tenterfield. A few weeks ago my bushwalking mate and I spent 3 days walking and camping in Sundown NP and I’ve decided a description of our walk may be useful to those who follow us into this interesting park. Travelling from Brisbane on the first morning it was midday before we hopped out of the car at The Broadwater (Southern end of the park). The 4 kms of dirt road into the park was in good condition and my 2 wheel drive vehicle had no problems. They’d had about an inch of rain a week earlier but there was only a couple of puddles near the road. We had no major plan other than to walk and camp so we literally made our decisions as we walked away from the car and saw the first track signs. Initially we considered going right along McAllisters Creek and up to Mt Donaldson and complete an anti-clockwise loop. However, we didn’t see the track off to the right and before we knew it we were at the ‘Permanent Waterhole’. With a bit of hind-sight I believe the McAllisters Creek turnoff is straight out of the carpark. But as I said earlier; we were just happy to be out of Brisbane, and up for a walk. 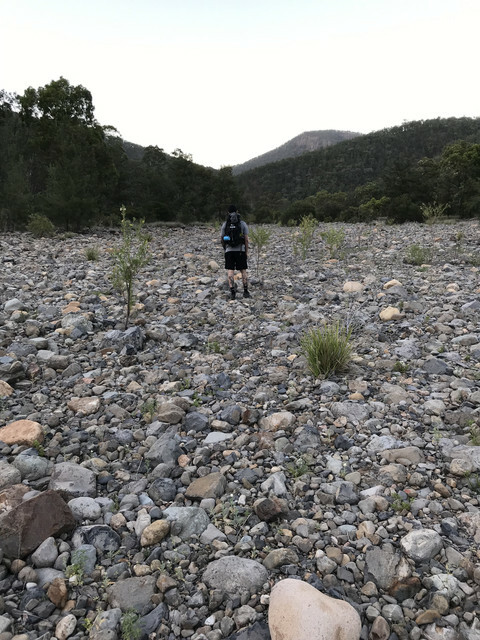 So faced with the last track sign we would see for 3 days – we turned left at Permanent Waterhole and headed up Ooline Creek with a rough plan to walk the Blue Gorge-Ooline Creek circuit in a clockwise direction. If you’re considering this will be a trail or marked track you’re wrong. As soon as you leave Permanent Waterhole you are just following the Ooline creek bed up. I was surprised just how pretty the creek was and how enjoyable the walk was. The creek was easy to follow and with just a little water flowing down its entire length. Plenty of signs that it had had a good flush out in recent years and there was no problem walking up the creek bed. As we got further up the creek it did get steeper and there were just a couple of spots where we needed to clamber up around rock pools and small waterfalls. About 3-4kms from the park fence the terrain once again became flatter and a number of small creek beds joined Ooline. (Not all marked on the topo map). Confident we wouldn’t accidently turn off Ooline we continued on. Thinking we must be close to the point where we needed to leave Ooline and join the park fence track I checked against the GPS I was carrying and discovered we’d turned off to the right about 1km from the fence and weren’t on Ooline Creek anyomre. The decision was made to head directly across country to the North to once again cut across Ooline creek and join the fence track. Climbing up the ridge out of ‘our’ incorrect creek we found an open flat area just above Ooline Creek and decided that was our camp for the night. We were really lucky with the weather conditions as the overnight temp must have been around 10-12C. Very mild for this area at this time of year. Day two we headed down into the Ooline creek bed and up the other side across country and 10 minutes later we came upon the park boundary fence and its associated fire trail. Heading North East along the fence we made good time to join Blue Gorge Creek. The GPS is of course an invaluable tool for cross checking that you are on the right creek as there are numerous creeks and gullies – not all marked on topo’s. Another beautiful creek and the early going as we headed South East was easy and enjoyable. Numerous pools and small waterfalls and small sandy coloured gorges. However, about 2/3 of the way down to joining the Severn River the waterfalls get steeper and deeper. After having navigated a couple of these with some trouble we came upon a series of drops which were clearly beyond us. (I’d read about this section from people who had come in the other direction up Blue Gorge Creek, so wasn’t surprised). We looked up to the left and found no joy so we decided to contour around to the right until we could find a way down. 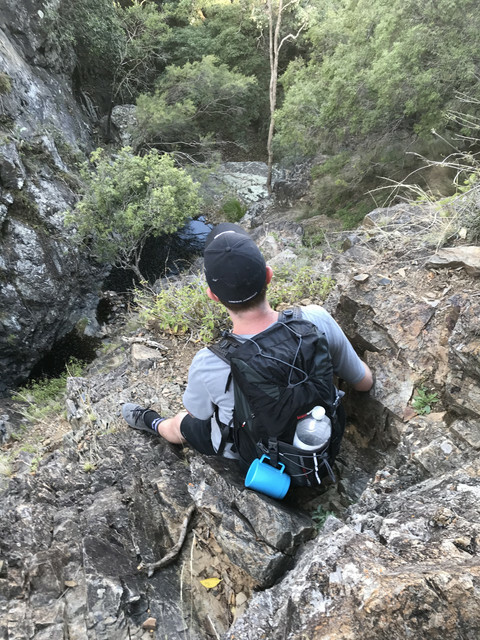 With the help of the map and the GPS we ended up spending an hour or so clambering around the hill and across a couple of creeks before making our way out onto the ridge that leads you down to rejoin Blue Gorge Creek - literally 50mts before it joins the Severn River. It is a very good idea not to give away any height until you can get to this ridge as further down you will be crossing the creeks on the way across where they have very steep sides. On the higher slopes they just rocky gullies that can be crossed relatively easily. The ridge we then used to get down the slope is very walker friendly and a lovely change from the contour to get there. We spent some time discussing what we would have done if we’d been heading up the creek instead of down. You would find it really difficult very early in the climb and committed part way up the creek hard to find a way up. It may be worthwhile starting up the ridge that we used and try and rejoin higher up. (That would mean standing at the intersection of the Severn and looking up Blue Gorge Creek, you would head up the ridge immediately on your left to avoid the steepest of the waterfalls in Blue Gorge Creek). The Severn River was a pleasant surprise. A wide flat river bed on a very gentle slope. We walked for about an hour before we came upon an inside curve of the river that provided a large flat grassed area perfect for our night two camp. We spent a lot more time getting down Blue Gorge Creek than we thought we would. After another mild night we spent the morning walking down the Severn back to the car. The Severn creek bed is very wide and snakes across the countryside. It’s easy walking and about midday we were surprised to see the carpark off to our right. We’d walked straight past the Permanent Waterhole and the only section of marked trail. A really fun 3 days out in a park which was far prettier and more impressive than I had anticipated. I would suggest our walk to anyone with a bit of fitness and the ability to read a map and use a GPS. Even the descent down Blue Gorge Creek was great fun and a good challenge. We’re now keen to come back and find that track up McAllisters and around via Mt Donaldson. I just spent three days in the park with the goal of summiting Mt Donaldson and following the 'circuit'. The river was flowing high so I found a small rapid section 500m up river from the info shelter, crossed, then tracked down the true left towards the McAllister Creek Valley. After walking for a couple of hours I set up camp on a small tent size patch of grass as it was getting late. Started early up the creek and over a couple of medium waterfalls that i need to do in bare feet till I got to a slot canyon with a vertical 10m waterfall. This might have been splitrock falls im not sure but couldnt see an obvious way around without scaling the high ridges on either side. I figured if I had to gain that much elevation just to get around the waterfall I might as well beeline for the summit as the maps made it look like a kind ridge. I found a "Track" abit down from the falls on the true right that I used to work my way toward the spine of the ridge. I eventually bumped into the dingo fence and followed it as it was going up the spine towards the summit. The going was good for awhile but as you get higher the scrub gets really close together to the point of having to bush-bash for every meter in some parts. I dont know what the scrub type is but it has white fluffy buds with pointy sharp dead and dying branches in every direction so its a nightmare with they are packed tight. I followed the fence line as best as I could, following clearing, animal tracks and openings where possible making sure to stay on the right direction. You get to a T point in the fences so I climbed over and headed towards the summit. The scrub is really bad here and I was almost thinking of turning back for my water was running low and wishing I had gaiters but I continued over a small dry creek valley and fought my way up to the summit. I was greeted by 4 or 5 wedge tailed eagles circling above and awesome vistas on a clear day and a small rock cairn. The whole way up I was waving a small stick into front of me to give the orb weavers a chance to get away other than my face. There was no way in hell I was dealing with that scrub again so looking at the map I saw a gully that lead back to the river. After a steep rocky and scruby descent from the top of Donaldson I found the gully which turns into donaldson creek. I was relieved to find a few small pools of water to fill up my bottles ( using water purifying tabs ) . 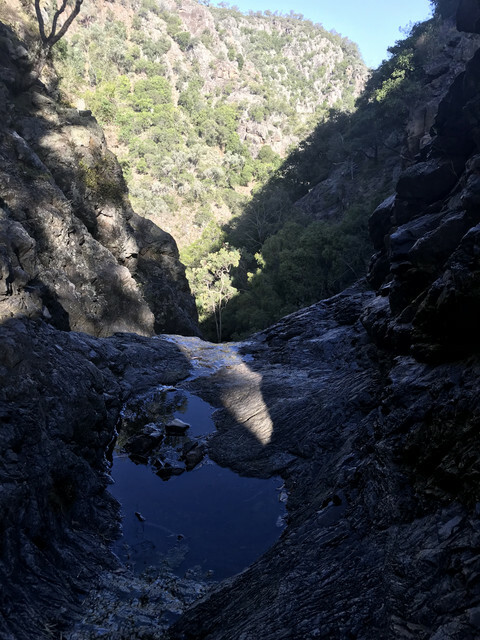 Its a beautiful walking down the creek as in narrows and gets scrubby then opens out into grassy glades with little waterfalls (saw a black snake slither under a rock!). You come to a section where two creeks meet and there is a massive drop off/waterfall. This section is absolutely beautiful and I set up camp while the park proved itself worthy of its name. On the true right of the cliffs you can follow tracks to a good ridge that leads steady down to the Severn River. 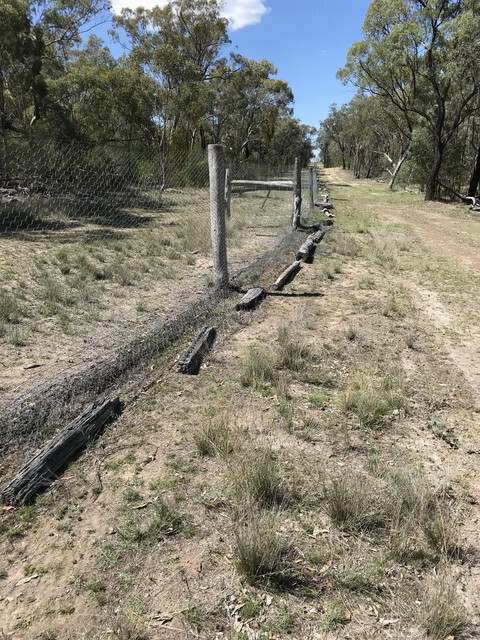 I bumped into the dingo fence and followed that most of the way down, I saw afew deer on the way down and just about stepped on a monitor lizard. Its quite a long walk back to the campsite down the river and had to cross countless times, I stuck to the rapids where I could see the ground. I was a tough walk up to the summit through the scrub it I camped in some amazing places. In hind sight perhaps I should have stuck to McAllister creek for longer to avoid the bush bashing but I couldn't see an obvious route. Cheers I hope this helps someone! Is anyone familiar with the park during the summer months. I'm thinking of throwing in the thermal wear for night sleep as I feel the bivvy bag might not be enough. The 30L pack I got is looking very, very tight; I have no idea how I'm going to squeeze everything in. If it's going to be cold in the early morning at this time of year, it will be down by the water. I'm a hot sleeper and i would be in shorts and a thermal top only. I'm also likely to not get into the bivvy bag. Kathryn and i have stayed down by the water (Severn) many a time in the tent inner only. We didn't even take the fly. Kathryn is in her down jkt here but she feels the cold (gets cold urticaria). Tent inner only and it's May. It sounds like you need a lighter and larger capacity pack. Yes definitively! Going to bring a beanie, neck warmer, thin wool socks and full thermals. It would be foolish risking it. Can't imagine a sleepless night because of being too cold especially after a 25-30k walk. We'll try to get the most out of the hike on Sat. Our plan is to do a Ooline Ck cct + a climb to Mt Donaldson. Yep the Deuter is bum of a pack but I don't want to buy a lovely Osprey 35L just for the w/end. Not into overnighters anymore, unfortunately. I am all pumped to visit Sundown. Wish me good luck to come across a spotted-tailed quoll. *Edited: packed the whole thing up minus the food and the extra 3L of water. I'm going to buy a new pack, a 38L one. You were right aardvark. I find the most versatile pack to be around the 40 - 50lt variety. You can make a big bag smaller but you can't make a small bag bigger. I'm spoilt for choice though. Do you know there to be quolls in Sundown NP?. It may be dingo free but there is plenty of goats, deer and snakes. Nearly every visit for me sees some sort of tragedy. Dying goats, bloated goats in the waterway, having to finish off a large deer with a pocket knife, wounded from an aerial cull days before. I don't mean the deer had a pocket knife. That could be threatening. I hope you get a good photo of a quoll. Even with no photo, the sighting would be an experience worth having. Lol yes. Better bigger just in case. I'll see pack I can find. Temperatures are unusually cold this time of the year that a bivvy bag might not be enough! Just checked the lowest temp. being 14C probably less near the water, possibly 10-12. Going to bring a down bag instead and skip the bivvy and the thermals. Strange they don't mention freshwater eels and the Murray River Cod because I read they are also found in the park. 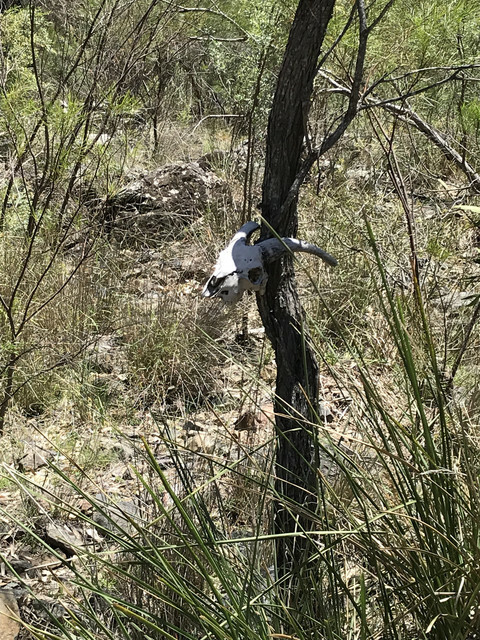 One of my mates said the only time he's ever seen a quoll was by the toilets at the broadwater camp at midday. I've seen spiny tail geckos there, if you have a walk around after dark targeting small fallen branches up to 30cm of the ground, you should have a good chance of seeing one. Have seen and caught a few Murray cod in the Severn with spin lures. Real decent sized fish as well. A very fortunate man your mate is. I'm hoping for that luck too. Lucky you for catching such a wonderful fish. I'm more than happy to spot one in the deep pools of Blue Gorge ck. Will upload photos after my trip. Impressive 'little' hike after being used to Mt Barney's terrain; however, the lack of water (any amount of water you find needs to be filtered and then wait 30 min for the tablets to finish their job) and the heat (Sat's hike after 10 pm was sitting between the 34-37C -It maxed about 1:15 pm- temp. range) made the journey strenuous. We reached the Severn River at 7:30pm head torches on for the easy last section of Blue Gorge. I wouldn't recommend anyone go down that Gorge in the dark, wet weather or after rain. One of the smaller waterfalls past the second big waterfall at the top of Blue Gorge, which requires a hairy traverse on the right side of the Gorge, cannot be downclimbed unless you put on your rock climbing shoes and are obviously a rock climber For this one we did a tricky traverse on the left side facing the Severn. We were dehydrated long before then and to a point we tghkut we were not going to make it! I reckon a filtration system must be used in summer if Sundown carries little water because you'll have to drink from any water source that is found even if it looks like tar. Unfortunately due to being dehydrated the day before, we decided to give Mt Donaldson and McAllister's Creek a miss. Wise decision. We returned to Broadwater Camp site following the course of the Severn. Highly recommended hike: Ooline Creek circuit. There is a Wikiloc file for it as well as for the extended one (Mt. D. + McA. ck). Thanks to the uploaders of both files. Holy crap. What are we getting into? Is this Comanche territory? The wild dog fence being mentioned several times on this thread. Blue Gorge first big waterfall. Downclimb it on the right hand side. Downclimbing Blue Gorge's first big waterfall towards the bottom section. 5am the morning after our gruelling Sat. 's walk. Severn River. It reminded us of the Siberian taiga. Amazing place! We are going back in April to finish our initial plan which included Mt Donaldson + McAllister's Ck. 1. Is there any water at all running through Mt Donaldson's Ck? 2. How about McAllister's Ck? Conditions obviously change all the time, year, month, week? It all depends on the rain Sundown gets. Can't say anything for Donaldson, but McCalister had a fair amount of pools (more frequent upstream) when I was there after a long dry period (April 2015). There seemed to be a bit of flow so there's probably a spring somewhere further up. I hope some rain rolls through for you next time, Sundown has a completely different atmosphere when the Severn is flowing ! Would love to see the Severn with water flowing in it like that! Thanks for sharing the pic. We will be returning after the summer is truly over, I don't enjoy hiking and being dehydrated the way we did. Awful experience! Let's hope Sundown sees some good rainfall soon.